President Barack Obama used his authority to appoint former Ohio attorney general Richard Cordray to head the Consumer Financial Protection Bureau Wednesday without approval from the Senate, which was in recess. By doing so, Obama defied Senate Republicans who had sought to block any and all such recess appointments by holding “pro-forma” sessions for the sole purpose of obstructing the president’s ability to fill executive branch and judicial vacancies. Obama’s decision to disregard the Senate’s procedural roadblocks sets something of a new legal precedent future Republican presidents may try to take advantage of—presidents typically have not made recess appointments during pro-forma sessions. On the other hand, as TPM’s Brian Beutler writes, Republicans were engaging in an “extra-legal attempt to nullify a key portion of an act of law” by blocking Cordray’s nomination to head the agency. 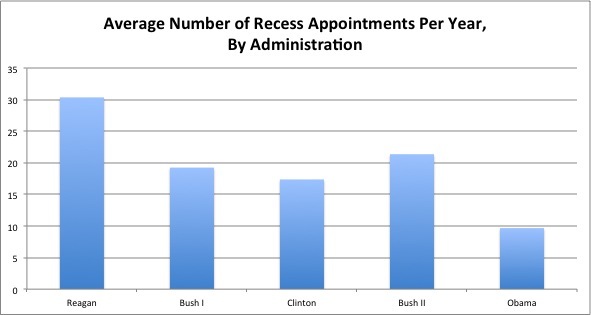 Data from the Congressional Research ServiceAccording to reports from the Congressional Research Service, during their time in office President Ronald Reagan made 240 recess appointments, President George H. W. Bush made 77 recess appointments, President Bill Clinton made 140 recess appointments, and George W. Bush made 171. Obama’s first term has seen a paltry 28. In this context, Obama’s move seems less like a power grab and more like the proverbial 98-pound weakling taking a second to wipe the sand out of his eyes.